The Long Beach Marines Marching Band has been a symbol of our community for generations. They perform at every home football game and various other events around Long Beach. The Marines Marching Band represented our great city in 2012, 2013, & 2015 in Manhattan at the 68th, 69th, & 71st Annual Columbus Day Parades and has been featured on ABC and MSG Varsity at the Newsday Marching Band Festival. The marching band originated with traveling musicians who performed together at festivals and celebrations throughout the ancient world. It evolved and became more structured within the armies of the early city-states, becoming the basis for the military band, from which the modern marching band emerged. As musicians became less important in directing the movement of troops on the battlefield, the bands moved into increasingly ceremonial roles – an intermediate stage which provided some of the instrumentation and music for marching bands was the modern brass band, which also evolved out of the military tradition. Many military traditions survive in modern marching band. Bands that march in formation will often be ordered to “dress their ranks” and “cover down their files”. They may be called to “attention”, and given orders such as “about face” and “forward march”. Uniforms of many marching bands still resemble military uniforms. Another innovation that appeared at roughly the same time as the field show and marching in formations was the fight song. University fight songs are often closely associated with a university’s band. 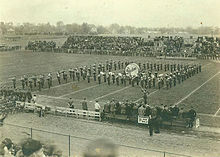 The University of Illinois also had the first fight song, “Illinois Loyalty”. Many of the more recognizable and popular fight songs are widely utilized by high schools across the country. Four university fight songs commonly used by high schools are the University of Michigan‘s “The Victors“, The University of Illinois‘ “Illinois Loyalty“, the University of Notre Dame‘s “Victory March“, and the United States Naval Academy‘s “Anchors Aweigh“.